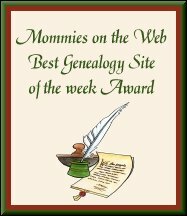 Here is an extensive list of links to useful Web pages about Genealogy. Here is a Web site I created for Mercer County, New Jersey, genealogy. Here are the genealogy webrings that I manage. If you have webpages about these topics, you are invited to join. Here is a list of books about Genealogy that are currently available (in print).